This summer we’ve been growing both Tomatillo and Tamarillo plants, and never again will we confuse the “little tomato” from the very different “tree tomato”. We sowed the soft, bushy tomatillo (Physallis ixocarpa) in spring, and we had fruits from mid-summer – sweet little green balloons that ripened to butter yellow, then popped open like Cape Gooseberries and fell to the ground. The tree tomatoes – or tamarillo (Cyphomandra betacea) – stand two meters tall with clusters of fruit that slowly ripen to a beautiful deep red. The taste of these two very different tomatoes can be described as “unusual, interesting or an acquired taste”. Why not visit our gardens while they’re in fruit and try for yourself? Ah, so it is not the tree tomato! Every greengrocer in Kenya sells freshly squeezed tree tomato juice and it is just heavenly. A tall cold glass of this juice seems to make the world and my immune system just right. Also fabulous with vodka for a healthy girls night out! A freshly-squeezed glass of tree tomato juice sounds simply delicious! Are your Tomatillos available for purchase? I live close to the sea in the False Bay area. 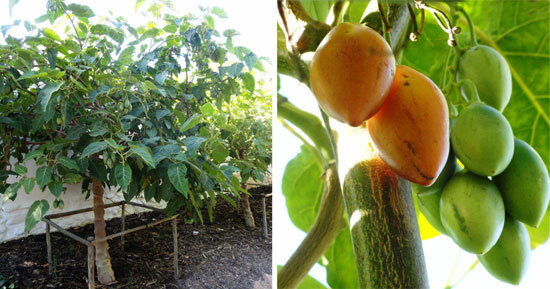 Would love to grow a Tamarillo tree as I LOVE the fruit. Do you think I can? Hi Mary-Anne. You can definitely plant and grow a Tamarillo tree there, just be sure to plant it in a sheltered spot as they do not like the wind very much.